Om Bhur, Om Bhuvah, Om Svahah, Om Mahah, Om Janah, Om Tapah, Om Satyam Om, Avahayami, Avahayami, Avahayami. Earth, Sky, Creation, Great, People, Spiritual Penance, Truth, we call upon you, we call upon you, we call upon you. Let there be Peace, Peace, Peace (at the 3 levels of our dimensions)… manifested through the sound of creation. All beings live within the 3 planes of their dimension of Existence, the Megacosmic, the Macrocosmic and the Microcosmic. That is why the saying “As Above, So Below”. This is because truth reflects at all levels of existence. If you tune into a particular level correctly, you will read complete truth in its format, which is the same truth that is there at the other levels too. When you recite the 2nd para of the Gayatri Mantra thrice, the first invocation is for the Megacosmic level because you are calling for awakening from the higher realms, which is then passing into your Macrocosmic level and then into your Microcosmic level. I love this page, Darryl. This Mantrum has so much Power. This mantra reminds me of how we are all connected to the earth, the sky, and heaven. We as humans act as if our bodies are not from the earth, made of matter, atoms, cells, chemicals. That our souls are not made from whispery words and thoughts of spirit from another world, the world beyond that not all can see. Yoga connects (yokes) me to both pieces of body and soul, earth and sky. The threads of the connection, the connective tissue, binding thoughts is the unseen, precious and beautiful God/Higher Power who exists in both earth and heaven, and in each and every one of us. Wonderful! Thank you for sharing your views Aiyoob. Super!! good explanation really. i will start reading this now onwards. Even i heard somewhere that Gayathri mantram should not be chanted by Women but not have a source at the moment saying that. let me google out and ask few more friends and reply. 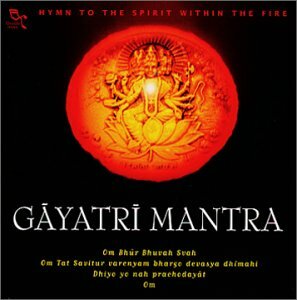 yes, gayatri mantra has best benefit when chanted in mind, facing sun god in the morning..